Old Redcliffians have moved out of the relegation places after victory over rivals Barnstaple in National Two South. Old Reds’ recent resurgence means they are now two points clear of the bottom three while London Irish Wild Geese have fallen into the drop zone following a home defeat to Clifton. Fellow strugglers Wimbledon are still fighting for survival after their victory away at Broadstreet and with the Dons hosting Old Redcliffians in Round 29, this immense relegation battle certainly has more twists ahead. At the right end of the division, Cinderford are on the brink of a place in National One after an excellent win over Taunton Titans while second placed Chinnor showed their character once again to edge past Bury St Edmunds. 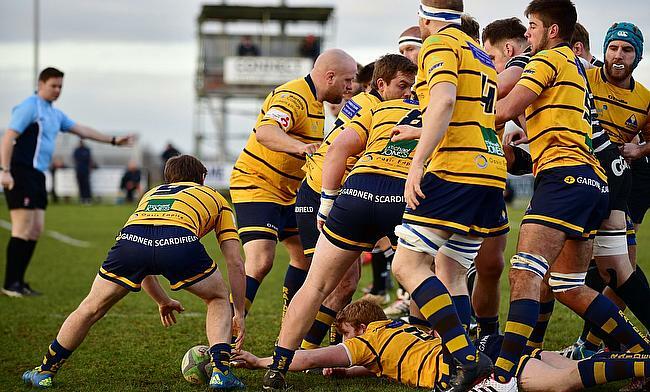 Elsewhere, Redingensians consolidated third spot with a home win over Canterbury, Tonbridge Juddians beat Redruth and Worthing Raiders emerged victorious from a thrilling battle with Henley Hawks. Cinderford took another stride towards the National Two South title as they ran six tries past Taunton Titans. Following a third-minute try from Reuben Norville, Ed Bouge, Harry Hone and Norville again all crossed to earn the Foresters a bonus point by half-time. Full time 41-24, thanks @Taunton_RFC for a great game! Gary Kingdom kicked a penalty for Taunton and also converted scores from Aron Struminski and Brett Harvey. After prop James Kenny had scored Taunton’s third try after the restart, Cinderford crossed twice through Dale Lemon and Hone to seal the victory. Paul Morris’ side are now eight points clear at the summit and just three more points from their final two matches of the campaign will secure promotion to National One. A late penalty try saw Chinnor beat Bury St Edmunds to deny Cinderford the National Two South title for another week. In a dramatic finish, Matt Williams’ side battered the Bury line before they were eventually awarded a penalty try to seal their eighth victory on the spin. It completed Chinnor’s comeback from 12-0 down, with Ben Manning’s brace as well as another penalty try proving to be the difference as Bury’s indiscipline cost them. Two first-half Mark Kohler tries plus efforts from Ross Taylor and Will Scholes earned the Wolfpack two points, but they will be rueing the four yellow cards which they were shown during this encounter. Redingensians resisted a strong display from Canterbury to emerge victorious as they stayed on track for a third placed finish. Aiden Moss’s first half-try gave Canterbury the early lead and the visitors held on to their advantage until the break, despite two penalties from Adrian Jarvis. But, Ben Henderson put the hosts in front after half-time and the boot of Jarvis kept Canterbury at bay for the majority of the second period. However, the City Men responded on 75 minutes as Jonathan Murray cut Redingensians’ lead to just one point but Tom Vooght hit back to clinch the win for the home side who are now seven points clear of fourth placed Taunton. An improved second-half performance from Redruth was not enough to stop Tonbridge Juddians winning a thrilling National Two South match which featured nine tries. Hugo Watson and Will Colderick touched down as TJs took a 13-7 lead into half-time at the Slade. Tipiloma Kivalu had gone over for Redruth in the first period, but his side fell further behind immediately after the break as Charlie Edwards dotted down for the hosts. Redruth then responded through Jack Simmons, but Tom Nicholl’s try on the hour kept Tonbridge Juddians in control. Both sides exchanged tries once again as Luke Hattam’s effort was cancelled out by George Lawson, but the Reds did come away from Kent with a bonus-point when Richard Kevern darted over the line late on..
Worthing Raiders scored two late tries to see off Henley Hawks in an excellent contest at Roundstone Lane. The game was nip and tuck throughout, but it was Henley who led 24-22 at half-time as Tom Hall, Connor Hayhow, Marcus Lowe and Jack Robinson crossed. But Worthing responded after the interval, as Matt Walsh David McIIwane and George Harris added to Matt McLean’s first half hat-trick and Hammed Ajayi’s effort. Hayhow and Dave Hyde did level the match up with seven minutes to go, but tries from Kiba Richards and Harrison Sims clinched the win for Worthing in their final home game of the campaign. Clifton have confirmed their safety in National Two South as they stretched their winning to five matches. An honour to support #poundsforporge campaign with our odd socks on! The visitors went over on three occasions in the opening 15 minutes, but London Irish Wild Geese battled back to cut Clifton’s lead to just two points heading into the second period. However, that was as good as it got for the hosts as Clifton added 10 points after half-time to secure their status in this division for another season while defeat for London Irish Wild Geese has seen them slip into the bottom three. Old Redcliffians have moved out of the relegation places after a seven-try victory over Barnstaple at Scotland Lane. It is four wins from their last five games for Old Reds who now have their fate in their own hands with just two weeks in the season to go. Scott Coster, Jermaine Jones, Alex Harvey and Henry Bird all crossed in the first period to put the hosts in complete control. Tries from Mike Peek and Danny Southworth saw Barnstaple begin the second half on a positive note, but any momentum they had generated faded away as Robbie Smith, Kieran Hill and Scott Parsons touched down for the home side who are now two points clear of the trapdoor. Wimbledon are still clinging on to their place in National Two South as a strong final 30 minutes saw them clinch victory against relegated Broadstreet in the Midlands. The Dons found themselves 10 points down on 50 minutes, but tries from James Doe and Dan Laventure (2) helped them turn the game around to seal a bonus-point win. The men from Barham Road had to win to stay in the division for at least another week and that didn’t look likely at the interval as Broadstreet led thanks to scores from Chris Idehen and Nick Rhodes. Wimbledon cut Street’s half-time lead to just a point as Harry Tabb and Sam O’Leary-Blade dotted down. Both sides swapped tries after the break as Harry Hudson’s effort was matched by Chris York, but Broadstreet made it 29-19 when Boxall intelligently crossed. However, Wimbledon showed character to flip this game in their favour and now they require back to back wins to stay in this division.